The Dino-Lite Premier AM4113T is a convenient, easy to use, professional handheld digital microscope providing superior image quality with up to 200x optical magnification. It specializes in obtaining clear and accurate images up to 200x magnifications, capable of seeing grains of sand. Provides superior image quality with a 1.3 Megapixels sensor with natural color reproductions, and also has low light sensitivity. These features obtain superior image quality with recorded images for professional applications and quality unmatchable from the competition. The Dino-lite Premier AM4113T handheld design makes microscopy an easy and mobile experience. Save time by bringing the Dino-Lite with a laptop to examine objects of interest. Simple to use, just adjust a dial on the Dino-Lite to focus then with one of many ways take a picture, or record a video. Even annotate, measure, and distribute recorded data right away with easy to operate complimentary software compatible for a PC or MAC. 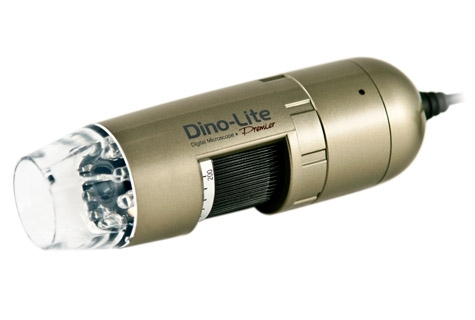 The Dino-Lite is ideal to use in industrial applications, education, office, or laboratory and a convenient device to have around.